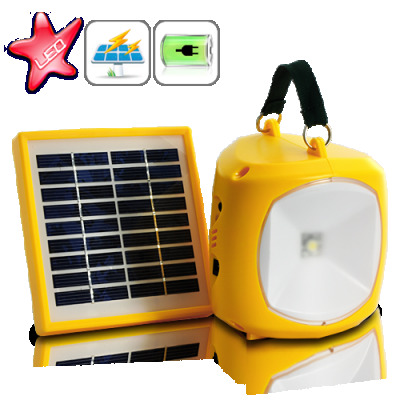 Successfully Added Ultra Portable and Bright Solar Lantern (4 Lighting Modes) to your Shopping Cart. A super bright Solar Lantern for outdoor activities as well as back up device! If you love nature and like spending your spare time camping in the countryside, mountain or at the beach you are aware a reliable source of light is essential but hard to get as torches and flashlights always run out of power. You agree with this fact too if you live in a remote area with frequent power outages. The use of candles is also limited due to their poor lighting. Well from now on no more such worries thanks to a fantastic product: the Solar Lantern! Provided with a solar panel, the Solar Lantern soaks up sunbeams until full charge. Except if you are located in the Extreme North, you get sunshine at least 8 hours every day so it should be fine wherever you go. However, in case of overcast sky, it is still possible to recharge it through DC plug. Once turned on, it offers 4 modes of lighting to adapt to different circumstances and environments. The brightest one provides powerful light to allow you to see through fog and in total darkness whereas bed light mode will give long-lasting performance and intimacy. The Solar Lantern will follow you without difficulties. Its weight is light, its handle and strap make it easy to carry and, on top of that, it looks pretty with its cool design! It is really safe to let your kids bring this lamp for scouting. Moreover it can be used as a mobile phone charger. It means you will be able to stay in touch with your family and business even climbing the Everest or exploring the deep and wild Amazonian jungle! The Solar Lantern is for fans of adventure, those in need of trustworthy lighting gadget, owners of gardens¡­ Everyone needs it so buy yours today! Brought to you by the leader in China wholesale electronics, Chinavasion. The lantern has really good light and operating hours. The solar panel is a bit too small to be used for everyday use. If solar is just needed as backup and AC adapter also can be used, this is a great lantern. Also remember, this is lead acid battery, which has to be charged every 3 months or so or it will loose capacity. Unlike Li battery, you can't just charge it and leave it in the closet and expect it to have full operation hours 6 moths later when you have power outage. Summary, this is a great lantern for its price. just bought.happy .over all the product is excellent .nice finish .